Did you know CherryMan has a new natural maraschino cherry? They don't use high fructose corn syrup in any of their cherries, what makes the natural cherries different is they use natural coloring and all natural ingredients, you can find out more about them here. The flavor is very close to a standard maraschino cherry, a little less sweet, and they taste very fresh and good. 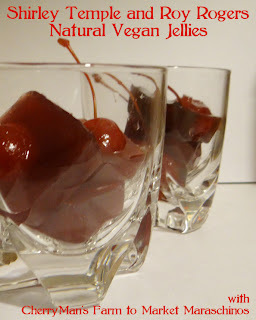 So it made sense to make Roy Rogers and Shirley Temple* jellies out of them. Shirley Temples are lemon-lime soda and grenadine with a maraschino cherry, and Roy Rogers are cola and grenadine with a cherry. Grenadine, the brands you see most in the supermarkets or liquor stores use a lot of high fructose corn syrup. In fact, it's the first ingredient mentioned. So.. to start my jellies, I needed to settle on ingredients. Grenadine is a pomegranate flavored syrup. To highlight the cherries, I used a Pomegranate/cherry juice. 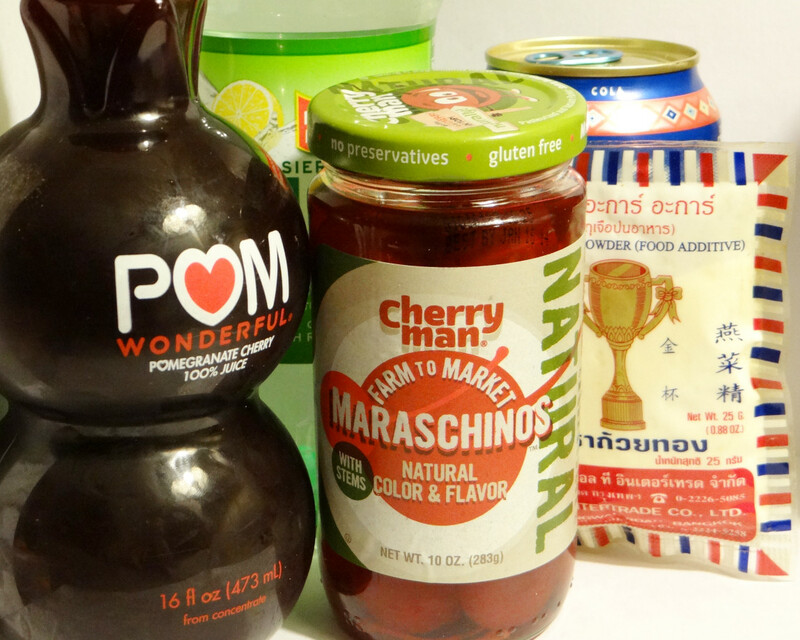 I picked natural sodas for the jellies which can be found in the health food section of any good supermarket. To gel, I used vegan friendly agar. Agar is a lot of fun, it gels a bit differently than gelatin. That little packet holds enough to gel several cups of liquid and generally it's cheaper at an Asian grocery than it is at a health food store. Generally a packet that size is under 1.50. In fact, I got that packet for 25¢ and use agar a lot as a stabilizer. Mix the soda and juice in a pan and bring to a simmer, sprinkle in the agar powder, and bring to a boil. Turn it down and let it simmer for 5 minutes. After it's simmered, pour it into the measuring up and pour it into your UNGREASED pan or silicone mold. Place in the cherries, then cover and put it in the fridge for an hour until cool. Unmolding. For a firmer set, more like Jell-o jiggles, use 2 tsps of agar powder. For an 8x8 pan, cut into squares using a ruler to make them very even. Usually 1 tsp of agar will set 2 cups of liquid, but the reason you use more than that with this recipe is because of how acidic the soda and juice are. Agar needs boiling to activate it then sets firmer and is stable in greater range of temperatures than gelatin. It's also vegan friendly which gelatin is not. Originally I tried to make this a sparkling jelly, but it didn't work out quite the way I envisioned. They taste really good! The flavors are more complex, fresher and more interesting than just a regular Shirley Temple or Roy Rogers. Check out CherryMan on Facebook for more recipes and ideas. *Quick personal story- when I was a kid, I LOVED Shirley Temples, and ordered them every chance I got. One day my Uncle took the family out to dinner, and the restaurant didn't have Shirley Temples! Oh the tragedy of it all. Then my mom told my Uncle "She really just likes the cherries." So he tipped the waitress 10 dollars and she brought me a bowl full of maraschino cherries. I didn't eat them all. Mom made me share with her. CherryMan provided the Farm to Market Marascinos to me in exchange for a review. The opinions expressed are my own. The jellies are my own too, but I've decided to be nice and share them with my family.